The Chinese love visual puns. 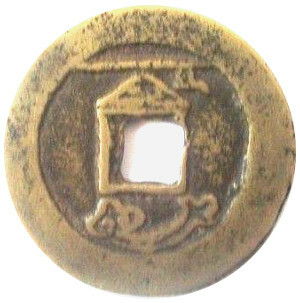 The old charm displayed at the left recently appeared in a Chinese coin forum. Although the quality of the images may not be the best, the symbols on the reverse side of the charm are a good example of a visual pun also known as a rebus. 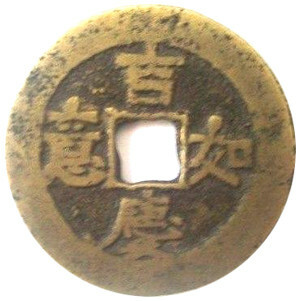 The inscription on the obverse side is ji qing ru yi (吉慶如意) which translates as “may your happiness be according to your wishes” or, alternatively, “may you achieve a rank according to your wishes”. The reverse side of the charm presents a visual puzzle consisting of three objects. At the very top is an ancient Chinese weapon known as a halberd. The Chinese halberd resembles a spear with a small crescent blade attached to the head. In the image shown here, the shaft of the halberd runs horizontally and the blade is hanging down from the right end. This ancient military weapon is known as a ji (戟) in Chinese. Just below the halberd is a triangular-shaped object which represents an ancient Chinese musical instrument known as a qing (磬). The qing was a percussion instrument which consisted of a number of these chevron-shaped stones hanging from a frame. The stone pieces were of different sizes and produced different pitched sounds when struck with a mallet. These chime stones were frequently made of jade and therefore also symbolize wealth and riches. Below the square hole is a sceptre which in ancient times represented power and authority. In Chinese, this sceptre is known as a ruyi (如意). The visual pun is thus complete because the three objects displayed on the reverse side of the charm read ji qing ruyi (戟磬如意). This sounds exactly the same as the ji qing ruyi (吉慶如意) inscription on the obverse side even though the Chinese characters are different. This charm dates from the Qing Dynasty (1644-1911) and cleverly illustrates the Chinese fondness for auspicious visual puns. Additional information on charms with this theme may be found here.